Love them. Can't live without them. They protect my face and eyes from the sun, they keep the sweat at bay and you can wear them when you don't want to do your HAIR! I am so bad about doing my hair much during the week. Up in the morning, wash my hair, pull it into a bun and throw on my running hat. That is all I have time for! So. 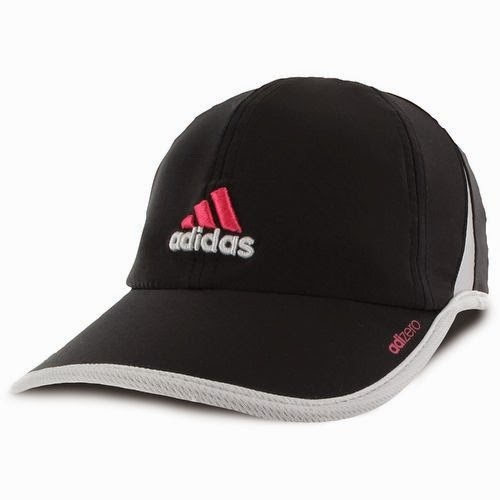 The running hat that I love is the Adidas adiZero II Cap. This hat is lightweight and breathable, it is comfortable and stays on your head - even during very windy weather. There is nothing worse than a running hat that flies off your head during a run. That has happened to me and it is NOT FUN. Also, I have a big head. Yep, I admitted it - a very big head. So, most women's running hats don't fit and I have to go to the men's section. I'd love to know - what is your go-to running hat?